FACT CHECK: Did This Bird Keep a Puppy Warm in Montana? Photographs showing a bird and a puppy appear to be real, but the accompanying backstory is suspect. Photographs show a bird warming a frozen puppy in Montana. A man finds a goose that was shaking with cold stuck to a pole in Montana. When approaching, the surprise is capital. The goose was sheltering with her wings a puppy that was about to die frozen. These images appear to be real. However, they weren’t taken recently, we’ve found no evidence that either animal was “stuck to a pole,” and we’re skeptical that these photographs were snapped in Montana (or anywhere in the United States). These photographs have been circulating on Chinese social media sites and news platforms, such as Weibo and Toutiao, since 2017. The earliest posting that we could uncover came from March of 2017 in a blog post on the Chinese news platform NetEase. The puppy was shivering coldly on the side of the road. Even the passing ducks couldn’t see it. But one puppy ran straight at the puppy and hugged it to keep it warm. When the dog was hugged by the duck, it did not struggle and was safely taken in the duck’s arms. It can be seen that the ducks have more love, and that mother love is great. 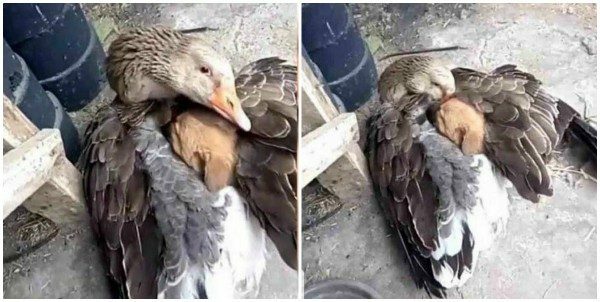 In the care of the mother duck, the puppy no longer has to be afraid of being cold, and only this kind of particularly caring duck mother will do this. The average animal will not be like this for children who are not their own. A note at the bottom of this story states that NetEase allows users to post their own content, and that the story solely represents the words of the author. In other words, no verification process takes place. 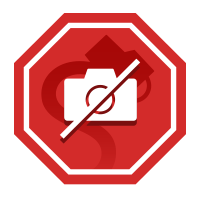 The story published to Netease didn’t provide many specifics about the photographs (such as where they were taken), and we haven’t been able to find any previous reports about them. While we can’t say for sure what these pictures capture, they have been circulating online on Chinese social media sites since at least 2017 and were most likely taken somewhere in that country. The superfluous claim about the duck’s being “stuck to a post” was added after the fact and appears to have been invented in an attempt to raise the stakes (and shareability) of this content. Although the back story behind these particular photographs may be unclear, it isn’t unprecedented for birds and dogs to strike up friendships. A pelican in Turkey named Osman became a bit of a local celebrity after befriending a dog. National Geographic. 6 February 2019.